September 2008 marks the 10th Anniversary of Google. Yes it's been ten years. As stated by Google itself on their company history page, "In September 1998, Google Inc. opened its door in Menlo Park, California." We've all heard the story about how Google got its name... Google is a play on the word googol, which refers to the number represented by the numeral 1 followed by 100 zeros. We've all heard rumors of some of Google's early investors including reports that included Shaquille O'Neille and Michael Jordan. Google has grown to become so popular that instead of the noun that it is, it has become a verb in everyday language. Some Google "Britney Spears", while other Google "car parts" or "auto insurance" or "price management". 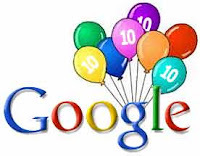 During the month of September, we will be paying homage to arguably the world's greatest search engine with a number of posts dedicated to ten years of Google-mania. We'll feature some of our favorite Google-related posts and will be counting down the top 100 Google moments from the past ten years. Of course there are those "Google Historians" who will argue that Google (GOOG) was created before 1998. While that is, in part true, Google officially launched in September 1998. Of course we could go on an on, but you get the point. Whether you like Google or you hate Google, can you imagine how different your world would be without Google? How would you find information about that digital camera that you want to buy? How would you find that receipe for key lime pie that you want to try? How would you find the nearest coffee shop? How would you find the distance from Las Vegas to Kelowna, BC, Canada? You would definitely be using search... most likely Yahoo or ASK. Or perhaps you would be using Super Pages or Business.com, but without Google's innovation in search, the results that you would be seeing would not necessarily be the results that you would hope to see. Google is the leader in search for a variety of reasons, but it's the innovation of the company that keeps them number one in search. Last year we wrote a piece on Google's Top 50 blogs. Looking at the list you see a long, diversified list of blogs that would not exist if it wasn't for Google. Google's innovation is unmatched by any company in the past ten years. In their efforts to organize the world's information, Google's motto to "Do no Evil" has resulted in access to information that previously would have taken much longer to locate and peruse. 'Nuff said Google, 'nuff said. Stayed tuned for part two in our tenth anniversary tribute to Google.